This years buck pole 11 bucks come in to be displayed. Although this was 4 less than last years pole, most the bucks were real nice and will provide the hunters with good memories of the hunt and full stomachs for many a meal in the upcoming winter months. Talk from most of the hunters stated that the woods were relatively quiet this year. The weather was rather mild for this time of year with temps hanging around 40ºF. The Atlanta Senior Class had hot dogs and fresh hot chili for sale at the pole that helped folks heat the chill out of the bones from being outside all day. 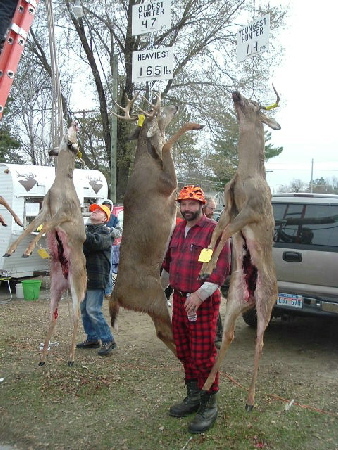 10 pt / 16" Spread / 165 lbs First Prize Winner! Ken Werner of K'nK Excavating for helping at the buck pole for all these years. Also, special thanks go out to Gordon & Cathy Green, Andy Green (37 yr old single white male) Al Bryce of the M.U.C.C. 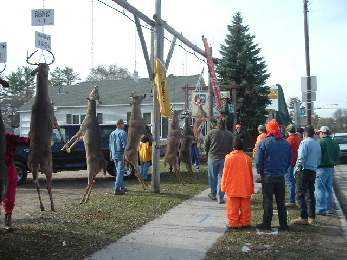 who helped hang, weigh and register the bucks. Also a thanks to Betty Comoford - President of the Atlanta Chamber of Commerce, Pete Hanson and to DJ's Cafe & McBrides Pizza & Sub's for providing hot food for the pole workers.